Raj the orangutan may not have the life that nature intended him, but at least he still hasn't lost his sense of wonder. Magician Matt G recently dropped by the Great Ape's enclosure at the UK's Colchester Zoo to break the monotony of Raj's day-to-day life in captivity. 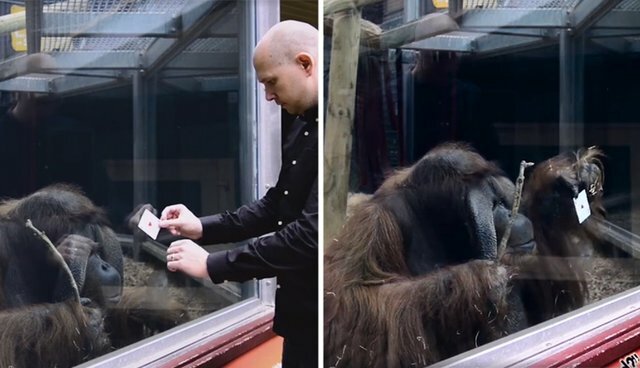 In a video captured of the visit, Mike G is shown performing a rather mind-boggling trick for his audience of one: passing a playing card to Raj, inexplicably, through the solid glass wall keeping them apart. Clearly baffled by the trick, Raj then tries to replicate it - giving the card a few taps with his makeshift magic wand. We, like Raj, have no idea how this trick was performed - but we're glad to know he got to keep his souvenir. For some folks, it might be difficult to find common ground with orangutans, and other animals fated to a life in captivity. In this moment of magic, however, it's more obvious than ever that we're not so different after all. Indeed, if you think to wonder is a human quality, then count Raj as one of your kin.